Ted Cruz made a speech at the RedState conference in which he laid out five actions he would take on his first day in office. Unlike promises to stop the oceans from rising and to heal the planet, these promises seem reasonable and in line with Cruz’s campaign message. Cruz assured the RedState audience, and by extension all of us, that he’s the one GOP presidential candidate who will keep his word. I wish he would add to the IRS item that he will order the IRS to cease denying tax exemptions on political grounds. 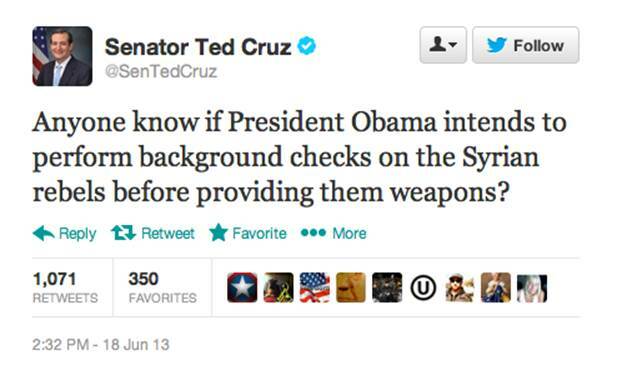 I also wonder whether he could even find all of Obama's illegal executive orders in just one day. Just FYI, the problem with the IRS is less to do with withholding tax exempt 501(c)3 status from conservative enterprises... It is more to do with collecting names off of all kinds of forms submitted by applying and existing non-profits and leaking them out. Where I live, the silence caused by this is deafening, with people whispering that their support for opposition activity, but they can't participate because their clearances are at risk, their assignments at work, their promotions... it's quite amazing how far it has gone. Very Soviet. Obama worked closely with the IRS on disenfranchising Republican and Tea Party voters. That is a federal crime. Cruz won't say this now, but if he is president he will get the IRS personnel to talk or they get 20/30 years behind bars. Then after they talk some big names will be seeing jail time. At the 1st press conference after the arrests, the left will jump on him. His answer: Which one of you is above the law. Raise you hand". After no hands go up, he has made his point and it is game over for the crooked Marxist Party. 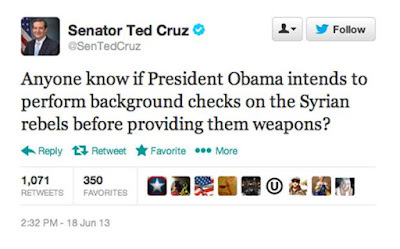 Cruz is a very, very smart lawyer. It would also be nice if he promised to get rid of every Muslim Brotherhood mole in the Obama Administration.